The lockers have a welded body construction. They are made of galvanised steel and have a durable powder coating in a range of colours and are well ventilated. Our locker range provides for secure storage of personal items and industrial safety equipment (including masks, helmets, earmuffs, boots etc.). Our lockers offer a variety of locking methods. 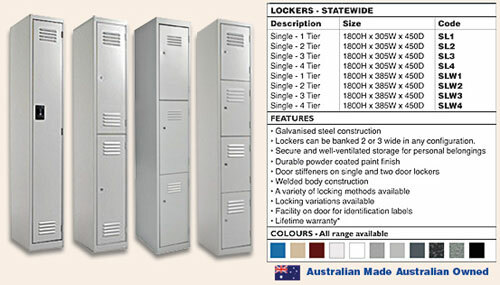 Our storage lockers come in various configurations including 1, 2, 3 or 4 doors variations.